Trying to decide whether to buy or lease a Honda? With the Honda lease specials offered near Sparta, NJ at Sussex Honda, the choice should be easy. Not only will you have access to the entire lineup of brand-new Honda models, from the Honda Civic to the Honda Odyssey, but you can also look forward to the latest technology and lower monthly payments. Explore your options, and then get in touch with the dealership to secure your lease deal today! 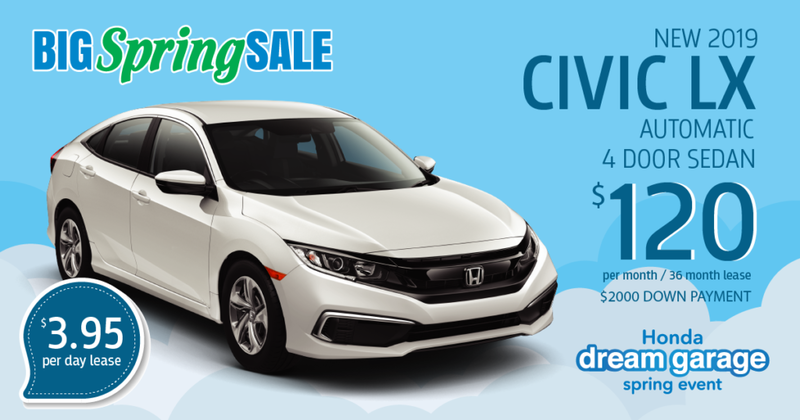 Lease a new 2019 Civic LX for just $120 per month for 36 months! 2019 Honda Civic LX Lease for 36 months at $120 with $2,000 down payment Stk#190381Vin#KH05 4-Cyl Engine, 4 Dr., Auto trans, P/S,B,W,L,M, AC, Airbags, Bluetooth Connect, Backup & lane watch right side camera, Abs ,CD/MP3, MSRP $21,145 Total due at inception $3,084 includes. $2,000 down payment,, $0 Sec. Dep. 1st Mo. $120 payment, $595 acquisition fee; and $369 documentary fee. Total lease payment = $4,320 Residual. $12,687. Lessee responsible for maintenance, excess wear & tear. 10,000 miles/$.15/mile thereafter. Price(s) include(s) all costs to be paid by a consumer, except for licensing costs, registration fees, destination and handling and taxes.. Special APR offer valid on new and unregistered 2019 Honda Civic LX models 4/3/19 through 4/30/19 To well qualified buyers on approved credit by Honda Financial Services through participating dealers. Must take new retail delivery on vehicle from dealer stock by date,4/30/19 Not all buyers may qualify. Higher rates apply for buyers with lower credit ratings. Dealers set actual prices. See your Honda dealer for details. Closed end lease based on # mos. Avail to customers who qual. For AHFC Super Preferred & Preferred credit tier Vehicles shown are for illus. purposes only. The ad supersedes and cancels all publ. and non publ. advertisements. Not responsible for typos errors or omissions. *Based on 2019 EPA mileage ratings. Use for comparison purposes only. Your actual mileage will vary depending on how you drive and maintain your vehicle. 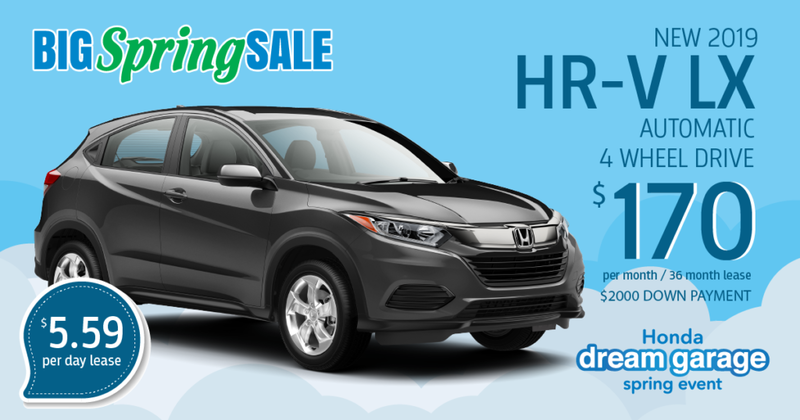 Lease a new 2019 HR-V LX AWD for just $170 per month for 36 months! 2019 Honda HR-V LX 4WD Lease for 36 months at $170 with $2,000 down payment Stkt#190884, Vin#KM709850,. 4-Cyl Engine., 4 dr., Auto P/S,B,W,L,M, AC, Airbags, Bluetooth Connect, Backup Camera, ABS, CD/MP3, MSRP $22,965. Total due at inception $3,134 includes $2,000 down payment, $0 Sec., Dep 1st Mo payment of $170, $595 acquisition fee, and $369 documentary fee. Total lease payment = $6,120, Residual $14,238 Lessee responsible for maintenance, excess wear & tear. 10,000 miles/$.15/mile thereafter. Price(s) include(s) all costs to be paid by a consumer, except for licensing costs, registration fees, destination and handling and taxes.. Special APR offer valid on new and unregistered 2019 Honda HR-V Sport models from 4/3/19 through 4/30/19 To well qualified buyers on approved credit by Honda Financial Services through participating dealers. Must take new retail delivery on vehicle from dealer stock by date,4/30/19. Not all buyers may qualify. Higher rates apply for buyers with lower credit ratings. Dealers set actual prices. See your Honda dealer for details. Closed end lease based on # mos. Avail to customers who qual. For AHFC Super Preferred & Preferred credit tier Vehicles shown are for illus. purposes only. The ad supersedes and cancels all publ. and non publ. advertisements. Not responsible for typos errors or omissions. *Based on 2019 EPA mileage ratings. Use for comparison purposes only. Your actual mileage will vary depending on how you drive and maintain your vehicle. 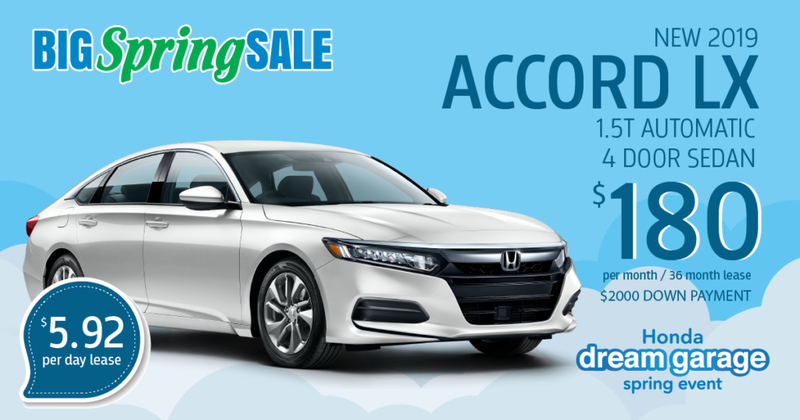 Lease a new 2019 Accord LX for just $180 per month for 36 months! 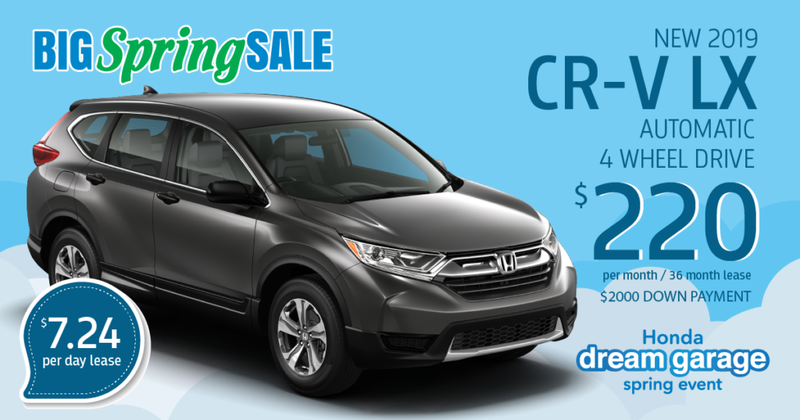 Lease a new 2019 CR-V LX 4WD for just $220 per month for 36 months! 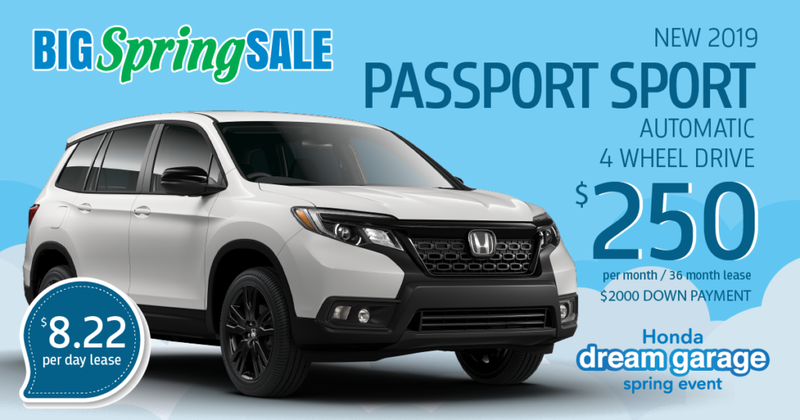 Lease a new 2019 Passport Sport 4WD for just $250 per month for 36 months!